Many skateboarders ride at night, and for good reasons. You may choose to go skateboarding after dark because that’s when you have the most free time, because the streets and sidewalks are much quieter, or because you want to practice without witnesses. Skateboarding at night can be riskier than in daylight (though not always). The risks associated with nighttime skating are related to insufficient lighting, which can lead you to trip over cracks, bumps, or high curbs. Lighting is a key aspect of night skateboarding. Carrying or wearing the right lights when skating after dark can make a big difference in terms of experience and safety. In this post, I examine the key reasons and risk for skateboarding at night, and the kind of lighting gear best-suited for skating after dark. You don’t have enough time to skate during the day, you can only do it at night. Night skating can also be very calm and relaxing. Skateboarding at night is mellower and allows you to escape car traffic, crowded sidewalks, rushed cyclists etc. The city or campus streets are typically empty at night. You don’t like skating in crowded skateparks and prefer to skate at night when no-one else does, assuming you have access to a local skatepark that doesn’t close after dark. In the summer, the weather at night is often cooler, and the air is often cleaner. A parking lot at work or near your home which is typically empty and stays lit at night. The main risks of skateboarding at night are when street lights and/or the moonlight are not strong enough for you to see the road condition ahead of time. Insufficient light can prevent you from spotting a big bump or crack to avoid it or jump over it, potentially causing you to wipe out. Sticking to routes you’re familiar with. Knowing about that big crack in the road or that high curb will help you avoid them even if you can’t see very clearly. Running bigger and softer wheels helps as they roll over cracks and obstacles better and more smoothly. In contrast, smaller street wheels can easily get caught and stopped dead in their tracks. Riding slower and in a more mellow style – gentle kick pushing and pumping at moderate speed vs speeding downhill or doing street tricks – will reduce your risk of crashing when riding at night. 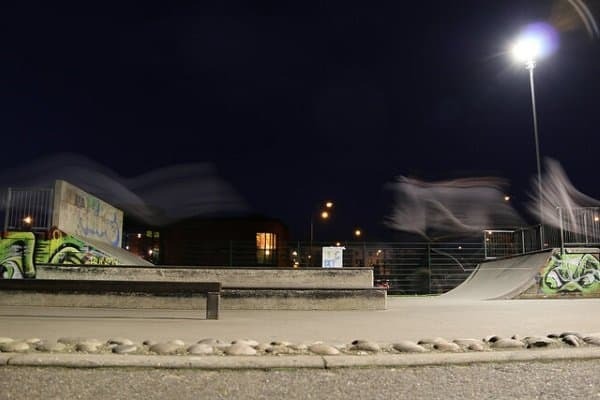 Using the right lights when skateboarding during dark hours can help a lot to reduce the risks of accident and injury (read on to learn more). When skateboarding at night, the street lights sometimes provide enough lighting for riding comfortably and safely. If traveling across darker areas, however, you may need your own lighting so you can see the road or sidewalk ahead of you to avoid bad pavement and obstacles. You also want to make yourself visible to other users (pedestrians, drivers, etc). Board lights attach to your skateboard deck or trucks and can cast off 3 to 10 feet of light, showing you the road immediately ahead. They also make you more visible to others. A good example is Third Kind skateboard lights (Amazon). This light system is designed to resist the impact and vibrations from skateboarding and is water resistant. It’s small and lightweight enough not to affect your ride. The battery lasts for 10 hours and is rechargeable through a micro-USB interface. the lights are very bright and visible up to 1 mile. Board lights like Third Kind look very cool when you’re skating at night, illuminating the bottom of your board with different colored lights. They do help make you more visible. The lights are strong enough to let you see road debris and potholes in front of you. However, when skating at night on dark streets with no street lights, you’ll still need to slow down to make sure you have enough time to avoid things. While the board lights will illuminate the front side of a bump, with the lights being so low you may not be able to see the depth of the bump or pothole and what’s behind it. Likewise, you may not be able to spot a crack until you’re nearly on top of it. Another caveat is that car drivers typically look about eye level, so they may not always see your lights which are close the ground when you’re coming around a corner or if the driver has something barring his/her view. All in all, board lights like Third Kind are great to make your board visible to faraway drivers and pedestrians at night and to help you better spot bumps and potholes on well-lit streets. For skateboarding safely and confidently in darker areas, however, you may something extra! Many headlamps, however, are only tuned for personal lighting and will illuminate 1-5 feet ahead, in a flood pattern. This can work OK if you’re riding very slow, but won’t illuminate road cracks that go across the road, for example. For faster riding, you generally want a more throwy pattern and with more power (higher lumens). A strong reliable headlamp with headband for serious night skateboarding is the Zebralight H600w Mk IV 18650 XHP35 (Amazon). It has a clear lens so you’ll be able to see further than with a model with a frosted optic. Neutral white is also a good choice for night skateboarding. Another solid alternative in a similar price and quality range is the ArmyTek Wizard Pro (2300 Lumen). When skateboarding at night, a powerful headlamp can work great, unless you’re riding in a group! When you skate with other people, you will often look at them (e.g. for talking to them), blinding them with your intense headlights. Also, when skating on the street at night, you often do horizontal scans with your eyes to check for cars. In doing so, you risk flashing drivers with your strong lights. 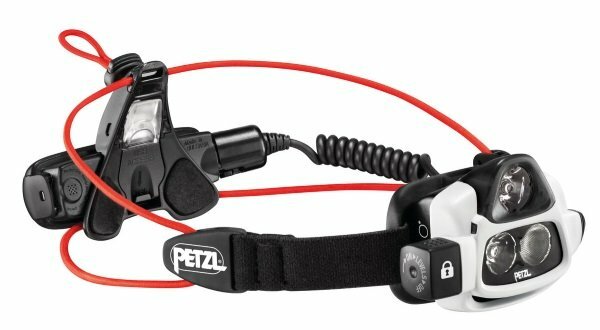 One way around this problem is to invest in a higher-end (though pricier) option, the Petzl Nao headlamp which uses reactive technology to brighten or dim the light based on what you’re looking at, through ambient lighting detection. Unlike normal headlamps, this lamp won’t blind other people when you look at them. Aside from reactive lighting, the Nao is also very lightweight (<200g) and boasts a red light on the back of the head strap, giving you added visibility from the rear. Using this lamp e.g. combined with a handheld led light bar can result in a very comfortable and safe ride at night. Aside from the blinding issue, another caveat of using a headlamp for skateboarding at night is that bugs tend to fly towards the headlamp and into your face. If you’re not comfortable with the goofy looks of a headlamp, or if the headband makes your forehead sweaty, an alternative is to carry a handheld lamp such as a super bright Thrunite flashlight. In addition to board lights and a headlamp/flashlight, you can complete your night skating arsenal with bike lights you mount on your helmet or strap to your arm. A good example if the popular and cheap Blitzu Gator 390 which will add to your visibility when skating at night. Is it legal to skateboard at night? It depends on your local laws, but in many states skateboarders are considered pedestrians, which means riding your skateboard at night is as legal as walking. However, it’s important to be aware of specific city regulations that prohibit skateboarding in certain public paths after a certain hour, e.g. you’re not supposed to skate on the ocean boardwalks in Los Angeles and San Diego. Skating in business districts and plazas is illegal in many cities as well (daytime or nightime). Skateboarding at night can be a very pleasant experience, allowing you to enjoy the city at night with no traffic or noise, practicing in parking lots or garages or traveling peacefully on sidewalks. Be sure to equip yourself with comfortable wheels and effective lighting for safe riding in the dark.